For other uses, see Bulldozer (disambiguation). A working bulldozer from the First Tractor Company, on Xinbu Island, Hainan, China. A bulldozer or dozer is a crawler (continuous tracked tractor) equipped with a substantial metal plate (known as a blade) used to push large quantities of soil, sand, rubble, or other such material during construction or conversion work and typically equipped at the rear with a claw-like device (known as a ripper) to loosen densely compacted materials. Bulldozers can be found on a wide range of sites, mines and quarries, military bases, heavy industry factories, engineering projects and farms. The term "bulldozer" correctly refers only to a tractor (usually tracked) fitted with a dozer blade. A Caterpillar D10N bulldozer equipped with a single shank ripper. Typically, bulldozers are large and powerful tracked heavy equipment. The tracks give them excellent ground holding capability and mobility through very rough terrain. Wide tracks help distribute the bulldozer's weight over a large area (decreasing ground pressure), thus preventing it from sinking in sandy or muddy ground. Extra wide tracks are known as swamp tracks or LGP (low ground pressure) tracks. Bulldozers have transmission systems designed to take advantage of the track system and provide excellent tractive force. The bulldozer's primary tools are the blade and the ripper. The word "bulldozer" is sometimes used inaccurately for other similar construction vehicles such as a large front loader. A straight blade ("S blade") which is short and has no lateral curve and no side wings and can be used for fine grading. A universal blade ("U blade") which is tall and very curved, and has large side wings to carry more material. An "S-U" (semi-U) combination blade which is shorter, has less curvature, and smaller side wings. This blade is typically used for pushing piles of large rocks, such as at a quarry. Blades can be fitted straight across the frame, or at an angle, sometimes using additional 'tilt cylinders' to vary the angle while moving. The bottom edge of the blade can be sharpened, e.g. to cut tree stumps. Sometimes a bulldozer is used to push another piece of earth moving equipment known as a "scraper". The towed Fresno Scraper, invented in 1883 by James Porteous, was the first design to enable this to be done economically, removing the soil from the cut and depositing it elsewhere on shallow ground (fill). Many dozer blades have a reinforced center section with this purpose in mind, and are called "bull blades". In military use, dozer blades are fixed on combat engineering vehicles and can optionally be fitted on other vehicles, such as artillery tractors such as the Type 73 or M8 Tractor. Dozer blades can also be mounted on main battle tanks, where it can be used to clear antitank obstacles, mines, and dig improvised shelters. Combat applications for dozer blades include clearing battlefield obstacles and preparing fire positions. The ripper is the long claw-like device on the back of the bulldozer. Rippers can come as a single (single shank/giant ripper) or in groups of two or more (multi shank rippers). Usually, a single shank is preferred for heavy ripping. The ripper shank is fitted with a replaceable tungsten steel alloy tip, referred to as a 'boot'. Ripping rock breaks the ground surface rock or pavement into small rubble easy to handle and transport, which can then be removed so grading can take place. With agricultural ripping, a farmer breaks up rocky or very hard earth (such as podzol hardpan), which is otherwise unploughable, in order to farm it. For example, much of the best land in the California wine country consists of old lava flows. The grower shatters the lava with heavy bulldozers so surface crops or trees can be planted. Some bulldozers are equipped with a less common rear attachment referred to as a stumpbuster, which is a single spike that protrudes horizontally and can be raised to get it (mostly) out of the way. A stumpbuster is used to split a tree stump. A bulldozer with a stumpbuster is used for landclearing operations, and is often equipped with a brush-rake blade. Bulldozers have been further modified over time to evolve into new machines which can work in ways that the original bulldozer cannot. Other modifications to the original bulldozer include making it smaller to let it operate in small work areas where movement is limited, such as in mining. Some lightweight form of bulldozer are commonly used in snow removal and as a tool for preparing winter sports areas for ski and snowboard sports. A very small light bulldozer is sometimes called a "calfdozer". In an angledozer the blade can be pushed forward at one end to make it easier to push material away to the side. Bulldozers employed for combat engineering roles are often fitted with armor to protect the driver from firearms and debris, enabling bulldozers to operate in combat zones. The most widely documented use is the Israeli Defence Forces' (IDF) militarized Caterpillar D9, for earth moving, clearing terrain obstacles, opening routes, detonating explosive charges. The extensive use of armored bulldozers during the Second Intifada drew controversy and criticism from human rights organizations while military experts saw it as a key factor in reducing IDF casualties. Some forces' engineer doctrines differentiate between a Low-Mobility Armoured Dozer (LMAD) and a High-Mobility Armoured Dozer (HMAD). The former is dependent on a flatbed to move it to its employment site, whereas the latter has a more robust engine and drive system designed to give it road mobility with a moderate range and speed. HMADs however normally lack the full cross-country mobility characteristics of a dozer-blade equipped tank or armoured personnel carrier. Some bulldozers have been fitted with armor by non-government civilian operators to prevent bystanders or police from interfering with the work performed by the bulldozer, as in the case of strikes or demolition of condemned buildings. This has also been done by civilians with a dispute with the authorities, such as Marvin Heemeyer, who outfitted his Komatsu D355A bulldozer with homemade composite armor to then demolish government buildings. A Liebherr bulldozer with a multi-shank ripper. Bulldozer for solid waste management. Three IDF Caterpillar D9 armored bulldozers. The IDF uses the D9 for combat engineering and counter-terrorism operations. In 1923, a young farmer named James Cummings and a draftsman named J. Earl McLeod made the first designs for the bulldozer. 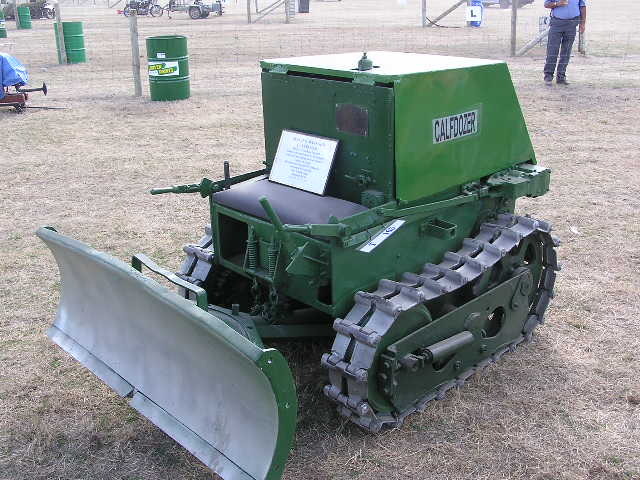 A replica is on display at the city park in Morrowville, Kansas where the two built the first bulldozer. On December 18, 1923, Cummings and McLeod filed U.S. patent #1,522,378 that was later issued on January 6, 1925 for an "Attachment for Tractors." By the 1920s, tracked vehicles became common, particularly the Caterpillar 60. Rubber-tired vehicles came into use in the 1940s. To dig canals, raise earth dams, and do other earth-moving jobs, these tractors were equipped with a large thick metal plate in front. (The blade got its curved shape later). In some early models the driver sat on top in the open without a cabin. There are three main types of bulldozer blades: a U-blade for pushing and carrying dirt relatively long distances, a straight blade for "knocking down" and spreading piles of dirt, and a brush rake for removing brush and roots. These attachments (home-built or built by small equipment manufacturers of attachments for wheeled and crawler tractors and trucks) appeared by 1929. Widespread acceptance of the bull-grader does not seem to appear before the mid-1930s. The addition of power down-force provided by hydraulic cylinders instead of just the weight of the blade made them the preferred excavation machine for large and small contractors alike by the 1940s, by which time the term "bulldozer" referred to the entire machine and not just the attachment. Over the years, bulldozers got bigger and more powerful in response to the demand for equipment suited for ever larger earthworks. Firms like Caterpillar, Komatsu, Case, Euclid, Allis Chalmers, Liebherr, LiuGong, Terex, Fiat-Allis, John Deere, BEML, XGMA and International Harvester manufactured large tracked-type earthmoving machines. R.G. LeTourneau and Caterpillar manufactured large rubber tired bulldozers. Bulldozers grew more sophisticated as time passed. Improvements include drivetrains analogous to (in automobiles) an automatic transmission instead of a manual transmission such as the early Euclid C-6 and TC-12 or Model C Tournadozer, blade movement controlled by hydraulic cylinders or electric motors instead of early models' cable winch/brake, and automatic grade control. Hydraulic cylinders enabled the application of down force, more precise manipulation of the blade and automated controls. A more recent innovation is the outfitting of bulldozers with GPS technology, such as manufactured by Topcon Positioning Systems, Inc., Trimble Inc, or Leica Geosystems for precise grade control and (potentially) "stakeless" construction. As a response to the many, -and often varying claims about these systems, The Kellogg Report published in 2010 a detailed comparison of all the manufacturers' systems, evaluating more than 200 features for dozers alone. Industry statistics based on 2010 production published by Off-Highway Research showed Shantui was the largest producer of bulldozers, making over 10,000 units that year or 2 in 5 crawler-type dozers made in the world. The next largest producer by number of units is Caterpillar Inc., which produced 6,400 units. Komatsu introduced the D575A in 1981, the D757A-2 in 1991, and the D575A-3 in 2002 that the company touts as the biggest bulldozer in the world. 19th century: term used in engineering for a horizontal forging press. 1886: "bulldozer" meant a large-caliber pistol and the person who wielded it. Late 19th century: "bulldozing" meant using brute force to push over or through any obstacle, with reference to two bulls pushing against each other's heads in a fight over dominance. 1930s: applied to the vehicle. These appeared as early as 1929, but were known as "bull grader" blades, and the term "bulldozer blade" did not appear to come into widespread use until the mid-1930s. "Bulldozer" now refers to the whole machine, not just the attachment. In contemporary usage, "bulldozer" is sometimes shortened to "dozer", and the verb "bulldozing" to "dozing", thus making a homophone with the pre-existing verb "dozing". Marvin Heemeyer, known for his rampage with a modified bulldozer. Caterpillar D8 bulldozer without a cab. ^ Trewhitt, Philip (1999). Armoured Fighting Vehicles. Dempsey-Parr. ISBN 1-84084-328-4. ^ Kansas Curiosities: Quirky Characters, Roadside Oddities & Other Offbeat Stuff. Retrieved 2012-04-01. ^ Patent 1522378, Attachment For Tractors, John E McLeod and James D Cummings, Filed December 18, 1923. ^ Haddock, Keith. "Euclid-General Motors' Crawler Tractor". PEI Tractor Club. Archived from the original on 19 March 2012. Retrieved 11 September 2011. ^ a b "Shantui officially largest dozer producer in the world". The Earthmover & Civil Contractor. May 2011. Archived from the original on 2013-05-21. ^ a b c "History of the Bulldozer". Retrieved 2008-12-17. ^ Kelly, John. "What in the Word?! The racist roots of 'bulldozer'". Oxford Dictionaries. Oxford University Press. Retrieved 21 October 2018. Wikimedia Commons has media related to Bulldozers.